An A for Buck Ruxton? Mr. Bakhtyar Rustomji Hakim obtained first place in the Medical Jurisprudence, Toxicology and Mental Diseases examination at the Final M.B.B.S. in October 1922 from a total number of students of 180. His record in other departments being on a par with this I have no hesitation in writing for him a letter of recommendation and good wishes for his future success. Bakhtyar Rustomji Hakim was a Parsi physician from Bombay (shown in photo) who continued his education in London and Edinburgh. After serving in the colonial military in Iraq during WWI, he moved to Britain, abandoned his Parsi wife in India, and disappeared without a trace after changing his name by deed poll to Buck Ruxton. He met and lived with Isabella Kerr, and they had several children together, presenting themselves socially as Dr. and Mrs. Ruxton. The couple fought a lot. Dr. Ruxton was “of a very jealous disposition and on the slightest pretence went into a violent rage.” One day in 1935, he accused Isabella of adultery and strangled her. Then he killed the family’s female servant, Mary Jane Rogerson. The women’s bodies were dismembered and buried in the woods, but later they were found. Buck Ruxton quickly became the prime suspect. The body parts were wrapped in newspaper, including one special edition published only in Ruxton’s locality. In a highly publicized trial, the Parsi doctor was convicted of the double murder. He was hanged at the age of 37 in Manchester in 1936. In the history of forensic science, the Buck Ruxton trial is famous for its early use of photographic and x-ray imaging in the courtroom. 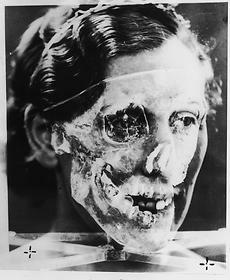 Experts overlaid a photograph of Isabella Ruxton on top of an x-ray of one skull found in the woods, suggesting that the two images fit (shown in image). Fingerprint identification and early forensic entomology (AKA “maggotology“) also played a role in the case. Two famous Scottish forensic experts–John Glaister Jr. and Sydney Smith–were experts in the trial. This brings me back to Prof. Nunan’s letter. Buck Ruxton got the top grade in his medical jurisprudence course while a medical student back in Bombay. What a strange twist that 13 years later, medical jurisprudence would continue to occupy Buck Ruxton–not as a forensic expert giving his opinion in a case, but because he was being tried for murder himself. In committing and trying to cover up his crimes, Dr. Ruxton joined a notorious line of physician-murderers. However, most of them (like the infamous Dr. Palmer) used poison, while Dr. Ruxton’s crimes seemed to lack premeditation or planning–hence the second death and the newspaper. Reading Prof. Nunan’s letter one cannot help by wonder: was Buck Ruxton a very good student of medical jurisprudence, or a very bad one? Could any of the letters of recommendation that we write turn out to be so wrong later? Stay tuned for more on Buck Ruxton and the Glasgow archives next month.